I’m very lucky to have so many amazing trails within minutes of my house. Since moving to New Paltz, NY in February, the Shawangunk Mountains have been my playground. I decided to participate in the Shawangunk Ridge Trail run/hike 20 miler as a tune-up and test for my 50k this coming weekend. In the inaugural event, Ken and Todd offered 3 days of racing to those who share the thrill of running wild on the trails of Hudson Valley. A 74-mile jaunt began Friday night. Out of 5 starters, only one man finished – kudos to him for toughing it out! Saturday hosted the 32 mile option – this one tempted me but I am not yet prepared to run such long distances so close in proximity. Plus, I heard that the first section of the 32-mile race was brutal! 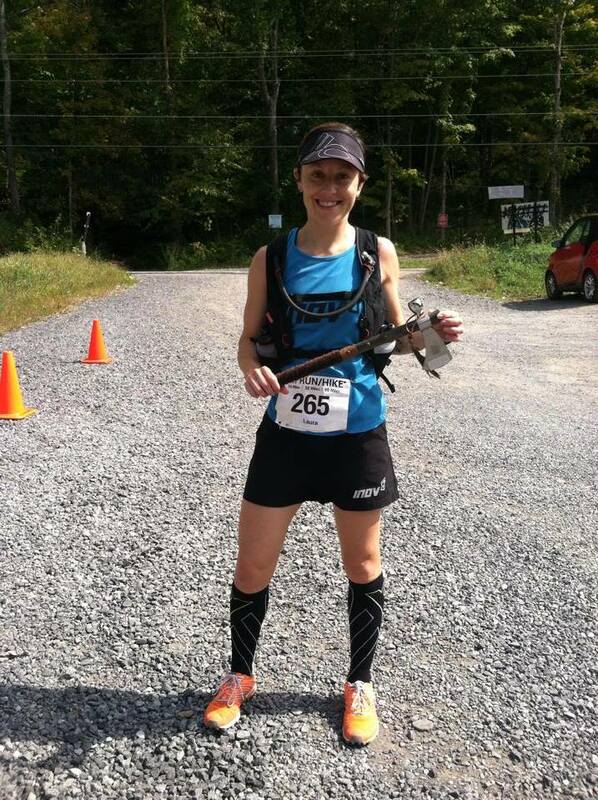 I opted for the 20-miler on Sunday, which turned out to be a perfect option for me. The race was point-to-point and un-supported which made it interesting. The trails were blazed by the Trail Conference, but there were no other markings. There was a GPS app you could download and 2 checkpoints along the course, but beyond that you were on your own. About half of the race took you through some great technical trails. You then transition onto the roads and run down the mountain before turning onto the Wallkill Valley Rail Trail for the last few miles to the finish. When we were released onto the trails, I went off the front along with 3 other guys – I could tell this was going to be a fast race. As the leader Jason pulled away I jumped in front of the other 2 guys for our first section of climbing. Before long we hit some descents and I could hear the 2 guys coming up quickly. I stepped aside to let them pass – this was a “training” race and I was not about to take any risks. This allowed the 3 guys to open a substantial gap on me but I was fine with this. Before even hitting 2 miles one of them went down hard with a twisted ankle. After making sure he was okay I once again took off into the woods – still a lot of miles ahead! Crossing over the road onto Chapel Trail – I forgot how tough that section is! I resorted to power-hiking at that point – this year I have learned when to embrace the power hike as a smart move and not to be ashamed of it! I was excited to arrive at Spring Farm because I knew there was only a little bit of climbing left to do on this course. I became anxious when I did not see a checkpoint there, as this was the section of the course I was unsure of. I came across Ken and asked him about the trails ahead. He assured me that I wouldn’t have any issues finding my way and I left it at that – forgetting he doesn’t know me and how easily I become lost 😉 Sure enough I popped out onto the carriage road, turned in the direction I knew was correct, but quickly questioned my route. I stopped halfway up a climb to look around, then started heading back down the hill before realizing I would have to run it again if it was in fact the correct route. I then resorted to pulling out my phone, pulling up the app, and confirming that I was on course. Phew! Now I took off at almost a sprint to make up for that unwanted break. Onto the rail trail at last – at a spot where I run a majority of my recovery miles. A section where miles tend to tick away quickly and effortlessly. Not today! The heat and humidity were starting to really take their toll and I felt like I was moving backwards. Passing the Rail Trail Café where I knew I’d be enjoying lunch soon gave me that last boost knowing I had less than 2 miles to go. And finally the trestle bridge – with no shade and thick, hot air I definitely got that dizzy feeling that the diagonal planks create. The finish line was just ahead and I was happy to see it! 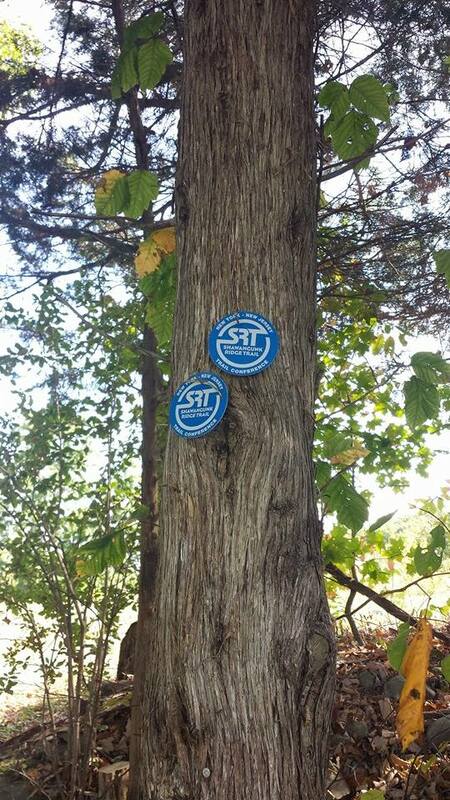 Congrats to everyone who tackled any of the SRT challenges! Thank you to Ken and Todd for creating such a cool event. 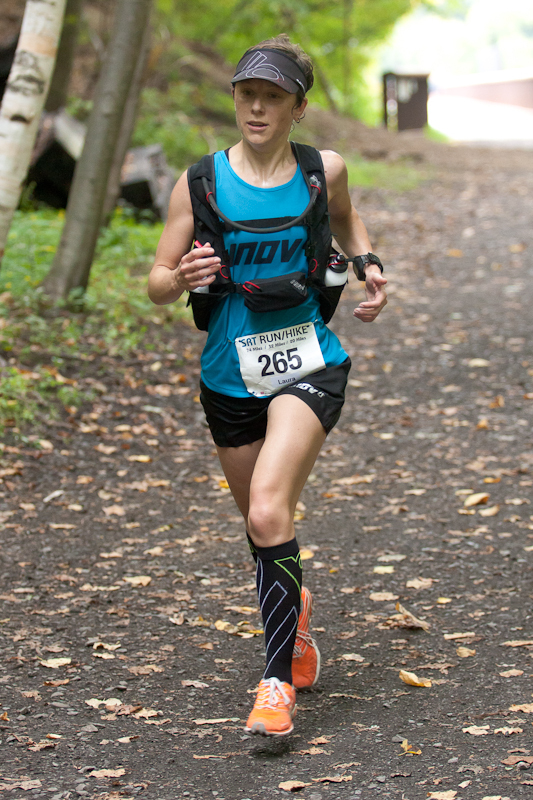 And of course thank you to Inov-8 and 110% for providing gear that allows me to run my best! This was my first time racing in my x-talon 190’s. I knew they would not be necessary for the road and rail trail portion of the race, but I was definitely happy to have them for the technical sections. And they did not feel uncomfortable or slow me down on the road and rail trail. This was my first time racing with the Race Ultra Vest and testing the full fluid capacity (2 liter reservoir + 2-500 ml bottles). I will be writing a product review of this vest soon, but for now I will tell you this was more comfortable to race in than I imagined! Another staple to my trail racing are 110%’s Flat Out Sox. 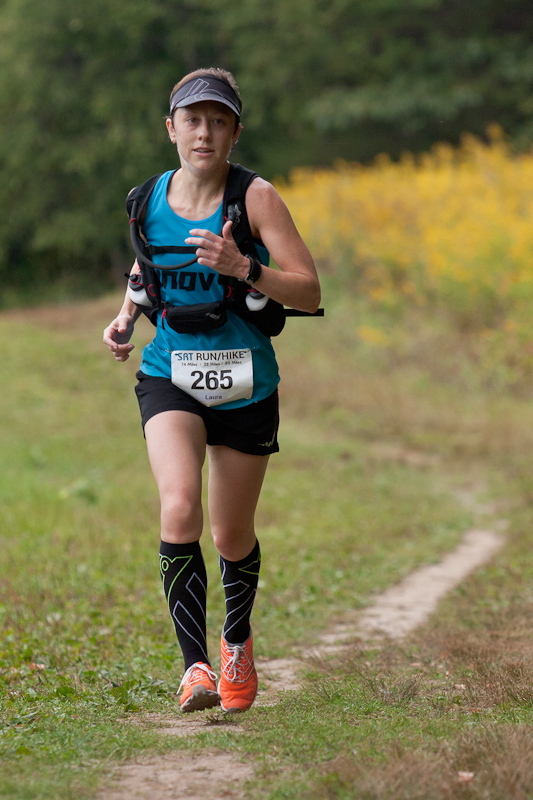 Tackling long miles on uneven terrain my legs welcome these fatigue-reducing compression socks to keep me feeling fresh through the finish line. 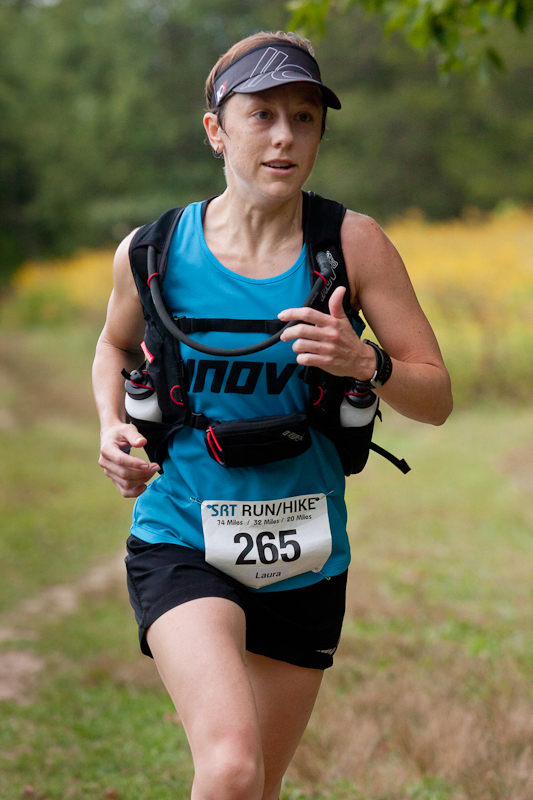 This entry was posted in inov-8, New Paltz, race, race report, trail race, trail running and tagged 110%, Flat Out Sox, inov-8, race report, race ultra vest, racing, Rail Trail Cafe, running, Shawangunk Ridge Trail, SRTrun/hike, trail racing, trail running, Wallkill Valley Rail Trail, x-talon by lljkline. Bookmark the permalink.